Pasalubong is a Filipino tradition of bringing home items after a vacation or a journey from faraway places. An example is whenever I travel to various places; I made it a habit to bring home some pasalubong. For instance, when I visited Mactan Island and Cebu City, I brought home broas, dried mangoes and danggit. Also, when I visited Davao, I brought home the local delicacies there like durian and durian candy. Bringing pasalubong for your family and love ones is a good tradition because people who came from far places are bringing tokens or items that will also make the people back home experience a little bit about the place that you visited. Like many traditions, pasalubong is also abused and there are people who care more about the pasalubong than the person bringing the pasalubong. If you are a Filipino, then I am sure that you either brought home pasalubong or received pasalubong from your family and friends. Foods, especially sweets, are the usual pasalubong items. Other pasalubong items are key chains and other small souvenir items that are not heavy on the pocket. I have a friend who buys key chains as his pasalubong for his office mates. What if you are in Metro Manila and you want to bring home pasalubong when you go home. Where can you find great pasalubong? Here are few of the shops that I can recommend. 1. Dolor's Kakanin - this is the shop famous for its sapin sapin, which is a kind of kakanin that is a mixture of various kakanin. 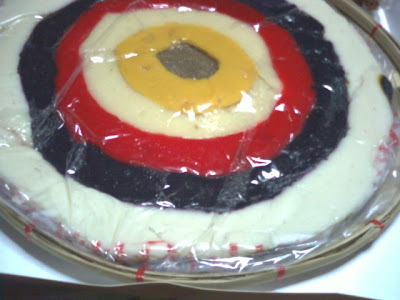 Dolor's sapin sapin has ube halaya, malagkit, and other kakanin that are suitable pasalubong. Aside from sapin-sapin, Dolor's sells other kakanin like puto, kutsinta and ube halaya. Dolor’s sapin-sapin is in demand during holiday seasons like Christmas and New Year. During the holiday seasons, I suggest that you call Mommy’s Pride first to reserve a sapin-sapin. See Dolor's Kakanin website for more info about their available pasalubong. 2. SM Hypermarkets – if you want a convenient place to buy your sweet pasalubongs, then I suggest that you visit SM Malls that have SM Hypermarkets. SM Hypermarket is the supermarket of SM Malls and they have booths there that sell kakanin and other food pasalubong. 3. Local markets – puto, kutsinta, and other kakanin can also be bought from local palengke (supermarkets) around Metro Manila. Most of the kakanin in the local markets are home-made but cheaper as compared to the ones in Mommy’s Pride and SM Hypermarkets. If you are in a tight budget, I suggest that you buy your pasalubong in the local markets. 4. Goldilocks – this is a cake shop that expanded their offerings. Now, Goldilocks also sell the usual pasalubong items like puto and kutsinta. They also have pulburon (polvoron) which is a kind of candy made from powdered milk. There are many Goldilocks shop around Metro Manila so it is convenient to buy your pasalubong there. Visit Goldilocks' website for more info. 5. House of Polvoron – if you are wishing to make pulburon (polvoron) as your pasalubong when you leave Manila, then I suggest that you buy your pasalubong in House of Polvoron. This shop sells the best polvoron in Metro Manila. The problem is that there is not much booth of House of Polvoron because they can only be found in selected malls around Metro Manila. However, I like their polvoron and their polvoron is better than the one I tasted in Goldilocks. Visit House of Polvoron website for more info. So there! Those are some of the shops around Metro Manila where you can buy pasalubong. If you are a foreigner visiting Manila, then I suggest that you bring home our best pasalubong items, especially the kakanin. Let you family and friends have a taste of Filipino sweets. Visit Before the Eastern Sunset and read about the obvious bias of the Philippine media. i love the pulvoron from goldilocks! yummy! Can I bring home balut as pasalubong? Hahaha!! Oh yes. Pasalubong are souvenirs, but they are more especially termed for foods that are brought home to family and friends after a long trip or vacation. Yup, special dried mangoes are prepared at Cebu. Many people like it, especially the Australians. Kakanin are sweets made from kanin (rice). There are different veriety of kakanin and sapin sapin is one of them. Yeah, Goldilocks' polvoron are yummy indeed. Of course you could. ^_^ But I am not sure if the airlines will allow balut inside their planes. hindi talaga ako mahulig magpasalubong...bumibili lang ako ngpasalubong pag me nanghihingi...pag galing naman ako rito samin, wala akong mabiling pasalubong..kelangan ko pang pumunta sa kabilang siyudad para mangalao ng specialties nila...haha la lang..uso talaga satin ang pasalubong ah hehe...pag pupunta ka sa ibang lugar un talaga agad bilin sayo ng mga kaibigan at kamag anak ..
Oo nga. Minsan pa nga, mas inaalala pa nila ang pasalubong kesa sa may dala ng pasalubong. my husband got the pasalubong fever now;) he esp.like our tanduay rhum and calamansi. My daughter's request is to bring her Goldilocks TARTs as "pasalubong" but it seemed that Goldilocks discontinued that line of products. May I know where to get them, please? I am looking specifically for the following flavors: Langka, Mango, Macapuno and Ube. I appreciate your soon reply. Thank you very very much. Talk soon. According to Goldilock's website, they only have caramel tarts. The flavors that you wanted are not available anymore.